‘Mannequins’ thrillingly combines the fantasy of theatre with the reality of craftsmanship. Clavé was first introduced to the world of costume and artistry aged 12, when he took a job in a shop selling girdles and corsets. Some fifteen years later in the 1940s Clavé had become an acclaimed set and costume designer, working on numerous operas and ballets. However, by 1950, the same year as he created ‘Mannequins’, Clavé had begun to leave the theatre behind to focus upon art. In ‘Mannequins’ Clavé dons the canvas with theatrical magic. Both mannequins and makers are depicted in a strikingly similar manner, creating an ambiguity over who is human and what is doll. With this charming trickery, the mannequin holds court with an unwavering gaze that is conversely noble yet intimate. Laid out like an artist’s studio, Clavé draws comparison between the role of an artist and that of a doll maker – bringing the inanimate to life through paint. Clave moved to Paris from Perpignan, where he had been held as a prisoner of war, in 1939. Paris proved to be a remarkably fruitful for Clavé and it was there in August 1944 that he met fellow Spaniard, Picasso. The two became close friends and the harlequin-esque depiction of the figures in his series of ‘Mannequins’ paintings is undoubtably influenced by that friendship. There is a certain darkness underlying ‘Mannequins’. With technology changing the landscape of warfare, Clavé grapples with the ‘machine man’ age. His figures mix the human with the mechanical in a way that is both playful and dramatic. Clavé follows in the footsteps of Georg Grosz and Otto Dix who painted the ‘machine man’ as a means of dealing with the horrors of World War I and their anxiety surrounding Modernity. Clave painted ‘Mannequins’ at 125 Boulevard Montparnasse, Paris – as noted on the back of the canvas. He also painted ‘Enfant à la Pastèque’, which is in the collection of Tate, London and other works from the Mannequins series, at this address. With a career in both theatre and painting, Clavé’s talent did not go unrecognised. He was nominated for two academy awards for Best Art Direction and Best Costume Design. Also an accomplished draughtsman, his work can also be found in illustrated editions of Voltaire’s ‘Candide’, Rabelais’ ‘Gargantua’ and Prosper Mérimée’s ‘Carmen’. 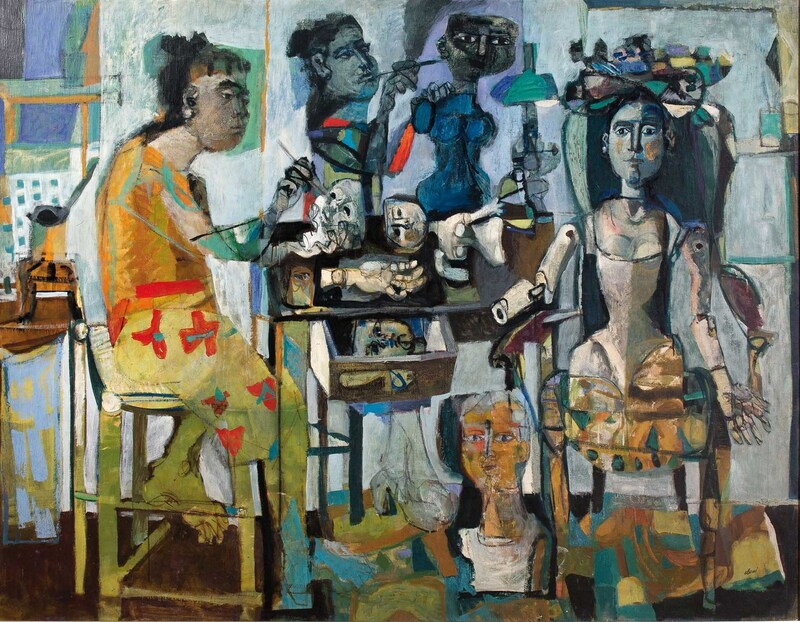 Examples of Clavé’s paintings are in numerous museums including the Reina Sofia, Madrid, Dallas Museum of Art, Dallas and Musée d’Art Moderne, Paris.